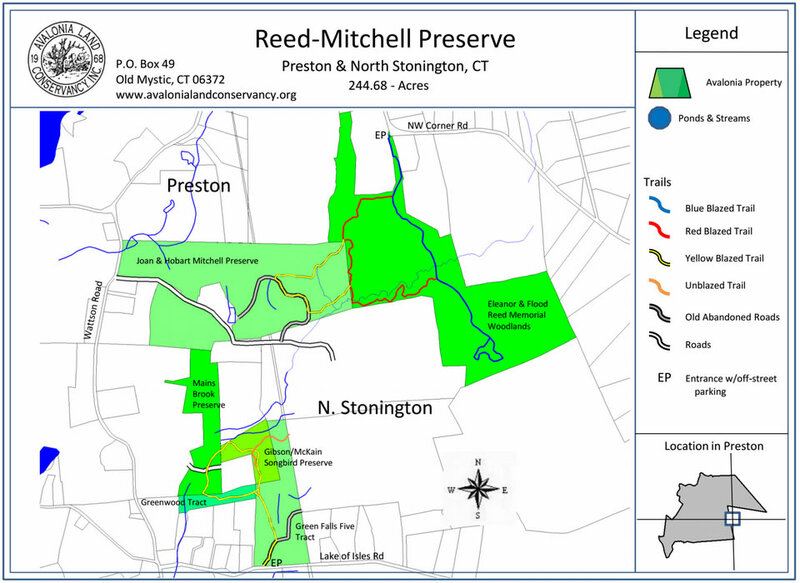 Six contiguous properties extending between Preston and North Stonington. Approximately 2.5 miles of hiking trails. Eleanor & Flood Reed Memorial Woodlands, 111.08 acres (1989) Hardwood forest with rugged topography; cedar- topped rock outcrops and promontories; old pond and meandering stream (Main Brook). Gibson / McKain Songbird Preserve, 9.22 acres (2008) Wetland songbird habitat. Green Falls Five Tract , 24.22 acres (2009) Wetland songbird habitat. Greenwood Tract, 4.98 acres (2001) wooded upland. Main Brook Preserve 20.21 acres (2005) Wetland and steep slopes on some lots east of preserve.